Neurobiology of Learning and Memory provides an excellent overview of current information on this fast-growing field of neurobiology. The contents have been structured for use as a course text or as a handy resource for researchers in neuro- and cognitive psychology. It discusses learning and memory from developmental, pharmacological, and psychobiological perspectives, as well as changes in learning and memory with age. 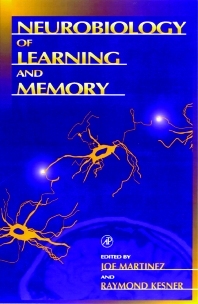 Neurobiology of Learning and Memory also includes research on invertebrates and vertebrates, presenting basics in anatomy and development along with computational models. It is written in an easy-to-follow format with summaries at the end of each chapter. Upper-level undergraduates, graduate students, researchers, and academics in cognitive psychology and neurobiology. M.R. Rosenzweig, Historical Perspectives on the Development of the Biology of Learning and Memory. J.E. Black and W.T. Greenough, Developmental Approaches to the Memory Process. A.J. Silva and K.P. Giese, Gene Targeting: A Novel Window into the Biology of Learning and Memory. N.M. White and J.A. Salinas, Pharmacological Approaches to the Study of Learning and Memory. C. Sahley and T. Crow, Invertebrate Learning: Current Perspectives. J.L. Martinez, Jr., E.J. Barea-Rodriguez, and B.E. Derrick, Long-Term Potentiation, Long-Term Depression, and Learning. C.A. Barnes, Memory Changes during Normal Aging: Neurobiological Correlates. B.S. Kapp, A.J. Silvestri, and F.A. Guarraci, Vertebrate Models of Learning and Memory. F.B. Gershberg and A.P. Shimamura, The Neuropsychology of Human Learning and Memory. R.P. Kesner, Neurobiological Views of Memory. M.A. Gluck and C.E. Myers, Psychobiological Models of Hippocampal Function in Learning and Memory. Index. Joe L. Martinez, Jr. is a Ewing Halsell Distinguished Chair at the University of Texas, San Antonio. His research focusses on the memory and the hippocampus with special attention to the opioid containing mossy fiver-CA3 projection. His recent work had identified important genes that are upregulated in the hippocampus following learning. Raymond Kesner is currently a Full Professor at the University of Utah where he has been a faculty member for 40 years. His major research interests are in the theoretical and applied aspects associated with the neurobiological basis of learning and memory in both animals and humans. He has also concentrated on the development of animal models paralleling mnemonic symptomatology in brain damaged patients.